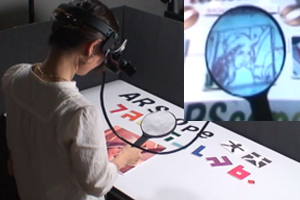 ARScope is a novel interface for various applications of augmented reality. A superimposed image is projected by a head-mounted projector onto a hand-held device covered with retro-reflective material. The background image is transformed into an image that is suitable for the user's current viewpoint without the use of markers or a head-tracking device.